November 2, 2015 – Today marks 15 years of continuous habitation aboard the International Space Station. The first two modules were launched and joined together in orbit in 1998. Other modules soon followed, and Expedition 1, the first station crew, docked November 2, 2000. As the station’s first resident crew, Commander William Shepherd and Flight Engineers Sergei Krikalev and Yuri Gidzenko spent 141 days in space, saw two space shuttle missions and the addition of a solar array truss structure and the U.S. Destiny laboratory module. 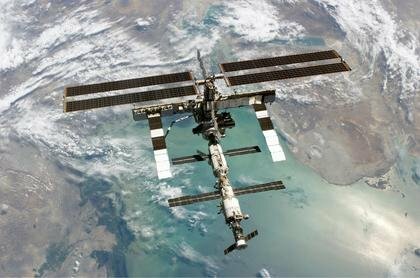 The International Space Station is the most complex scientific and technological endeavor ever undertaken, involving support from five space agencies representing 15 nations. As a research outpost, the station is a test bed for future technologies and a research laboratory for new, advanced industrial materials, communications technology, medical research and much more. The ability to control the variable of gravity in experiments lends itself to an amazing array of research possibilities. 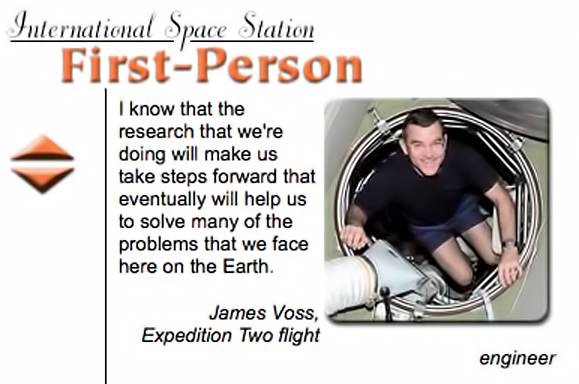 The first Colorado astronaut to serve aboard the station was James Voss, a member of Expedition 2. The Expedition 2 crew launched on March 8, 2001, on STS-102 Discovery and docked with the Space Station on March 9, 2001. As a member of the second crew to live on ISS, Voss served aboard the space station for a total of 163 days and returned to Earth with the STS-105 crew on August 22, 2001. During the expedition, Voss conducted spacewalks in both U.S. and Russian space suits, and he was the first person to operate the Space Station Robotic Manipulator System (Canadarm2). Other highlights of the mission included assembly tasks, 18 scientific experiments, a Soyuz capsule flyaround, addition of the joint airlock to ISS and five visiting spacecraft. In completing the mission, Voss logged a total of 167 days in space, including 9 hours and five minutes of EVA time. Voss received his Bachelor of Science in Aerospace Engineering from Auburn University in 1972. He received his Master of Science in Aerospace Engineering Sciences from the University of Colorado in 1974 and his honorary Doctorate from Colorado in 2000. He is a retired U.S. Army colonel and logged five Space Shuttle flights before serving as a member of the Expedition 2 crew. During his career, Voss logged 202 days in space and performed four spacewalks. 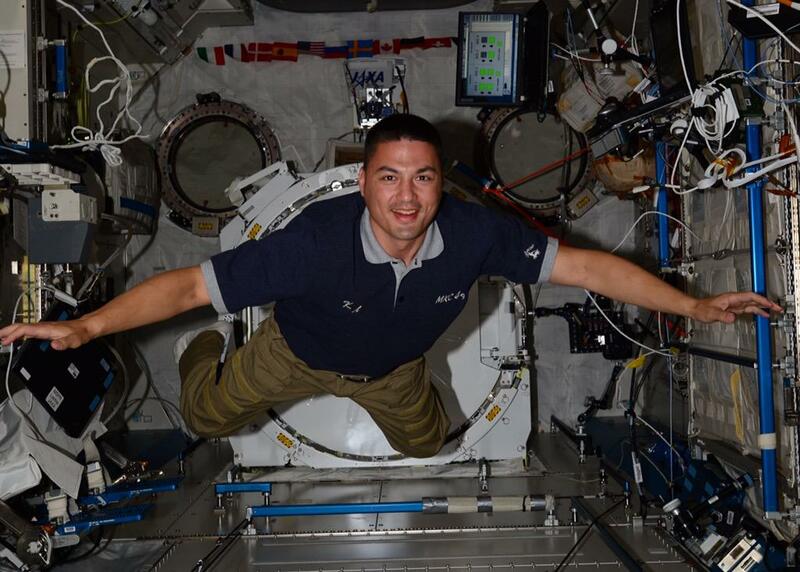 The current six-member crew on the ISS also includes a University of Colorado graduate. astronaut Kjell Lindgren. Lindgren is part of the Expedition 45 crew, along with fellow NASA astronaut Scott Kelly, Japanese astronaut Kimiya Yui and veteran cosmonauts Sergey Volkov, Mikhail Kornienko and Oleg Kononenko. Lindgren earned a bachelor of science degree in biology from the U.S. Air Force Academy in Colorado Springs. He continued his education, earning a master’s degree in cardio-physiology from Colorado State University in Fort Collins and a medical degree from the University of Colorado Boulder. Lindgren began working as a flight surgeon at NASA’s Johnson Space Center in Houston in 2007 before his selection to the astronaut corps in 2009. Lindgren and Kelly recently completed their first spacewalk and are looking forward to another on November 6.